Deputy Mayor of Jerusalem calls for introspection in religious community regarding attitude toward public Shabbat desecration. 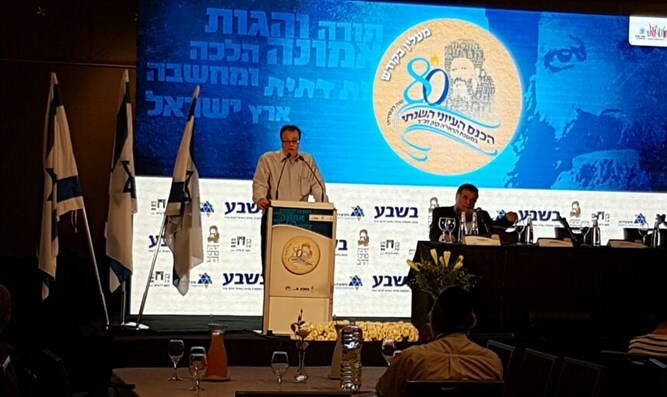 The Deputy Mayor of Jerusalem, Dov Kalmanovich, spoke today at the "Ma'alin Bakodesh" ("Increase holiness") conference organized by the Beit HaRav Kook (Rav Kook's home and Beit Midrash in central Jerusalem, which now houses a museum in his honor and an evening kollel) and the Hebrew weekly Besheva newspaper. Rabbi Avraham Yitzchak Hacohen Kook (1865-1935) was the first Ashkenazi Chief Rabbi of Israel, a renowned Torah luminary, poet, mystic and philosopher who was the spiritual founder of Religious Zionism and founder of Merkaz Harav Yeshiva in Jerusalem. The conference features speeches and discussions on the legacy and teachings of Rabbi Kook, and is being held in Jerusalem. Kalmanovich recounted: "Rabbi Kook died of a serious illness after he returned from a conference for strengthening Shabbat. We, as those who claim to perpetuate his legacy, do we make enough noise about Shabbat? Do we fight for the holiness of Shabbat like Rabbi Kook did?" "The battle isn't only in Tel Aviv or Jerusalem, rather it is a battle for the Jewish identity of the state of Israel," the Deputy Mayor claimed. "I assume we're not doing enough about terrorism either," he added, "if the Rabbi would wake up this morning after the terror attacks that occurred on Shabbat he would have been shocked to the core. Not only politicians need to react to terror, Rabbis must as well." "If Rabbi Kook were alive today, he would speak about terror, it would have burned in him like a fire. Why do we not hear Rabbinical voices today? We will continue walking in the Rabbi's path, and we hope that some small part of his strength and fortitude will rub off on us," Kalmanovich concluded. Kalmanovitz was the first person to be wounded in a terror attack in the First Intifada. On January 31, 1988, an Arab boy threw a petrol bomb at him on the outskirts of Ramallah as he was making his way home. Kalmanovitz was critically wounded with third-degree burns on 75% of his body. His life was saved when a passing driver stopped and rolled Kalmanovitz in sand, and he was then taken to the Hadassah Hospital in Jerusalem. Despite his critical condition survived and subsequently underwent a long rehabilitation process. Other speakers at the Conference include Torah luminaries of the Religious Zionist world such as Rabbi Zalman Baruch Melamed, Rabbi Chaim Druckman, Rabbi David Chai Hakohen, Rabbi Yaakov Filber and Rabbi Yaakov Shapira as well as Professor Shalom Rosenberg and Rabbi Yohanan Fried, CEO of the Museum at Beit HaRav..